JustHost.com can give customers a quick and easy way to get their website up and running. This provider has a plethora of inclusions in the basic package and offers several server options. Their base package includes accommodations for personal and business interests with strong site management features and secure servers for ecommerce checkout. They back their services with a satisfaction guarantee and offer a competitive price for this largely inclusive hosting package. Within the add-ons, tools such as WordPress, Google Adwords Credit, and Joomla CMS are also included. These options can make the website more socially interactive but can also earn marketing credits that may be furthered used toward site promotion. JustHost.com has well ranked reliability, with strong uptime that is backed by high quality processors. The servers are also equipped with a generator to contend with loss of power, and data is backed up automatically for file protection. 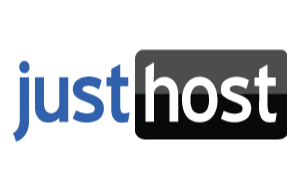 Customer service and tech support will also attend to any functionality issues, and the service guarantee that is offered by JustHost.com includes a refund if the host provider should not meet expectations. JustHost includes website design tools in the basic package, and also has accommodations for further creative inclusion with the one-click add-ons. Along with drag and drop features for building, it also incorporates scripts, photo galleries, and multimedia support for audio and video. Flash, Java, and Shockwave are supported as well, which lets customers add these interactive factors through the drag and drop builder. Templates can be accessed with the wordpress add-on, and customer support can provide further guidance. Plug-ins are also included to generate design and functionality, and give access to more general templates. The cPanel feature makes it easier to manage files and revise images and text before publishing pages. All of these factors are tailored to be personalized and user friendly, with a focus on ease and integration. JustHost.com gives customers a full hosting experience with many benefits at a highly reasonable price. The ecommerce abilities and security certificates are a big plus for small businesses and start-up enterprises, while unlimited data encourages growth without the concerns of over expanding. JustHost.com is highly regarded for customer support and is also dedicated to making web design an easy and intuitive process. This host gives clients all the tools, as well as the freedom to use them to their best effect. After having a bit of trouble trying to build my site the way I wanted it, I decided to call customer service for help and I was sure glad I did! Very knowledgeable and friendly! I’m very pleased with my JustHost.com experience so far, and I can’t wait to use the ad credits to see how far my business can really go! With the amount of perks included in the account, I found the prices offered by JustHost to be some of the most affordable I’ve seen. The mailing lists that JustHost lets us create help us to keep our customers up to date on all promotions and weekly news in a very convenient way. Cpanel is really easy to use, and by far my favorite control panel interface when it comes to user friendliness and efficiency. The online chat support that JustHost offers is really convenient when you’re trying to manage a website and a business. I was able to multitask while getting help to build my site. The image gallery script was perfect for showcasing our construction company. Now our future customers can go online to see all the work we’ve done around the area! I was very relieved that I could simply transfer my current domain name when switching to JustHost.com. This allowed me to keep my current traffic easily. The introductory price offer couldn’t be beat, and I loved that there was a guarantee just in case I wasn’t satisfied, but everything about building my site has exceeded my expectations so far! The included poll and survey software lets me keep my finger on the pulse of the public, and our customers love that they can help to improve our business in a very proactive way! I loved all of the different shopping cart options I had to choose from when building my web store, it really made me feel like I was building the exact site I wanted for my customers. Attaching our social networking pages to our webpages was easy, and resulted in a whole bunch of new followers. Plus, the script to include them on the site was free and easy to use. The ad credits alone that this hosting service provides really make the price a steal. I’m also impressed by how many new visitors Facebook has brought to my site. They’ve kept changing my .htaccess that caused downtime to my website. I would not recommend them. The site building with JustHost is really easy, with no experience I was able to get my business website up and moving within the span of a single day. I have a few webpages for my various online businesses, and I loved how JustHost let me manage all of my different sites from one account. I’m most impressed with the site statistics feature, it lets me track all of the new traffic for my small business site, and I can see which marketing methods have been most effective! Help us to help others by leaving a short review. What was your experience with JustHost?